The New York Police Department has acquired an arsenal of 14 drones to help monitor the city. The additions include 11 DJI Mavic Pro quadcopters for “tactical operations,” two workhorse DJI M210 RTK quadcopters for 3D mapping and search and rescue, and one DJI Inspire 1 quadcopter for training. According to the New York Post, a team of 29 police officers trained and received licenses to operate the drones, under the Technical Assistance Response Unit. 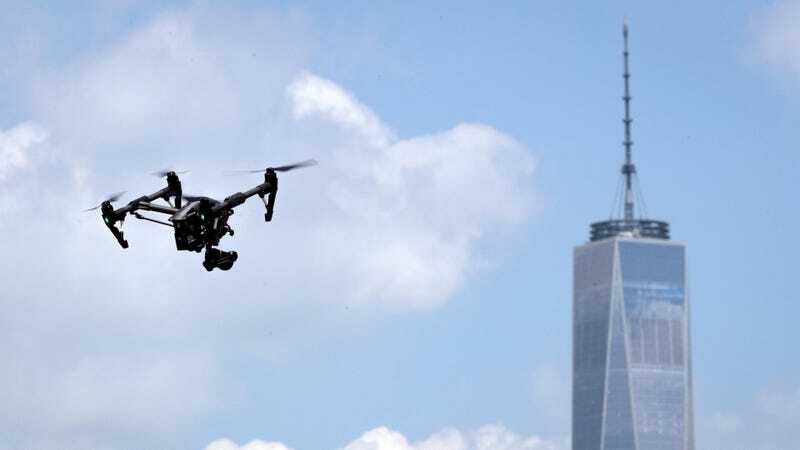 According to an NYPD announcement Tuesday, the law enforcement agency plans to use the drones for documenting crime scenes, monitoring traffic and popular events, and aiding hostage situations, among other uses. The NYPD announcement lists several “unacceptable uses” of the drone fleet, including routine patrol, traffic enforcement, immobilizing suspects, and warrantless searches. But, as we’ve asked before, as tech companies like DJI and Taser maker Axon continue to make more tools and weapons for law enforcement, who will police the police drones? The NYPD is just the latest of several cities that have announced plans to use drones in their work. Donovan Richards, chairman of New York City’s council committee on public safety, told the New York Times that NYPD asked the committee and the New York Civil Liberties Union for counsel on the police drones. But Richards was still skeptical of what would come of this initiative. “What we want to avoid is mission creep, where you start with the use of drones for traffic and before you know it, it’s being used for surveillance,” Richards told the Times. Richards said he would pursue safeguard legislation to prevent police from using the drones to infringe on citizen privacy. Updated: A previous version of this story cited the New York Times’ claim that the NYPD had a drone pilot program that ended in 2011. The Times has since removed the claim, saying in a correction that it found the pilot program didn’t involve drones.